A house in Corella was gutted by a blaze which erupted at past 10 a.m. on Thursday possibly due to an unattended candle which was lit inside the homeowner’s room who passed away eight hours before the fire broke out. 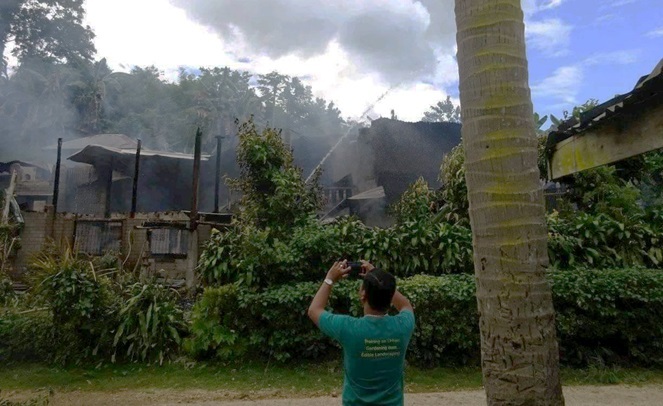 According to SPO1 Leropol Perocho of the Corella Police Station, the fire was declared under control at 12:20 p.m.
Percoho said that wife of Desiderio Durat, the house’s owner, died at 2 a.m. on the same day. The body was taken to a funeral home at 8 a.m. and Durat’s 20-year-old daughter was left alone at the house. Durat’s daughter was reportedly then told to light a candle inside her parents’ room. Perocho said that the candle may have fallen and sparked the fire. There was still an oxygen tank used by Durat’s wife left inside the room, he added. According to Perocho, the fire which raged for around two hours left P700,000 to P1 million in damages. The blaze was put out by Bureau of Fire Protection personnel from Tagbilaran City and Sikatuna.